A report on joint research efforts by the Shinshu University Interdisciplinary Graduate School of Science and Technology RIKEN Collaboration Laboratory (led by Associate Professor Naoki Kanayama and Professor Mizuo Maeda), The Institute of Physical and Chemical Research (RIKEN), and the Tokyo Institute of Technology were published in an electronic, special-issue edition of the American Chemical Society (ACS) journal Langmuir and thereafter selected to be featured on ACS Editors' Choice on November 29, 2016 (ACS Publications website: http://pubs.acs.org). ACS Editors' Choice publications are open access content and can be viewed free of charge. DNA of a biologic genetic information medium is a high molecule compound having negative electric charge, and forms double-stranded structure mutually associated with single-stranded DNA having complementary base sequence (double-stranded DNA). It has been reported that "DNA nanoparticles" that the surface of gold or polymer nanoparticles was covered with brushy double-stranded DNA show different dispersion behavior in solution between the complementary (G-C or A-T pair) and non-complementary cases of outermost base sequence (J. Am. Chem. Soc. 2003, 125, 1643). New genetic diagnosis and bioanalysis have been developed based on this phenomenon. 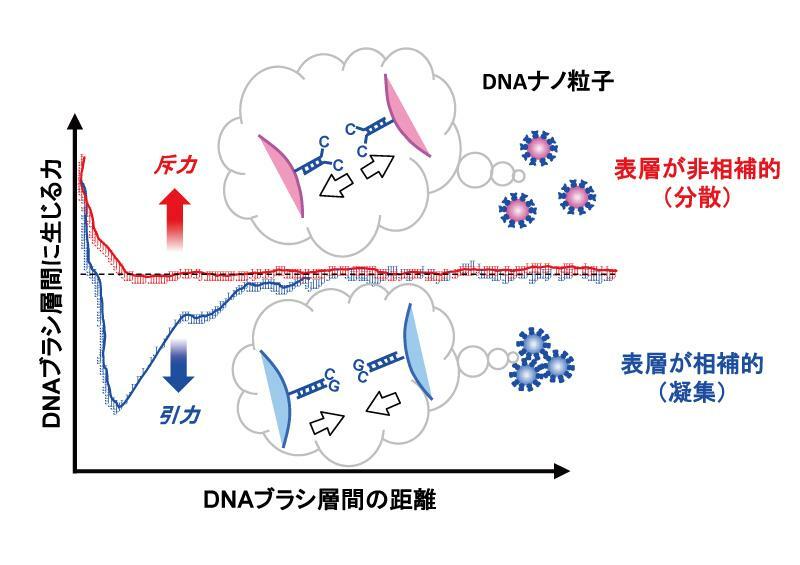 On the other hand, the fundamental mechanism saying why the macro physicality of dispersion behavior of DNA nanoparticles is changed by slight different structure of double-stranded DNA had been unknown for a long time. This time our collaborative research group tried direct measurement of the "force" generating between two DNA brush layers, using the liquid interface colloidal probe atomic force microscopy. These results demonstrate that the complemental base sequence of outermost layer generates the power mutually attracts (attractive force) and the non-complemental base sequence generates the force to mutually detach (repulsive force) between DNA brush layers. The present results will contribute to the understanding of dispersion behavior mechanism of DNA nanoparticles and also to the development of new diagnosis and analysis technologies used DNA nanoparticles.